HabsLinks: Elliotte Friedman speculated on the weekend that the Montreal Canadiens may consider trading forward Charles Hudon. They would be looking for a mid-round pick for him. Arpon Basu of The Athletic: The Canadiens are not a serious Cup contenders, but they are in the hunt. They shouldn’t be looking to make a big splash at the deadline – giving up a lot of future assets – but giving the team a little boost would be nice. 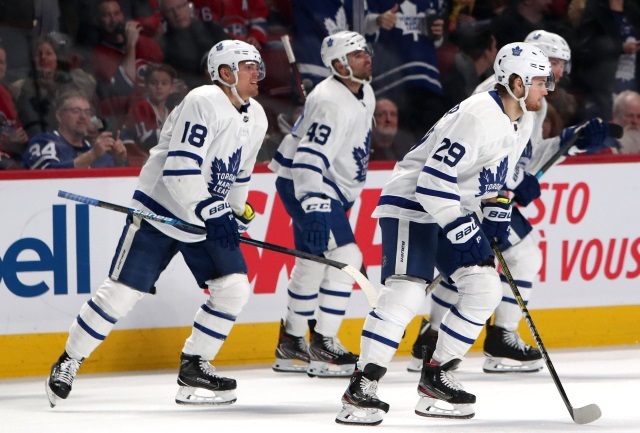 Luke Fox of Sportsnet: Unless defenseman Jake Gardiner is willing to take maybe $2 million less than he’d likely get on the open market, it will likely be his final season wearing a Toronto Maple Leafs jersey. The Maple Leafs will face an offseason cap crunch and will need to move out some salaries. Looking at six Maple Leaf players who could be moved this offseason. William Nylander – $6.96 million cap hit through 2024 – Contract heavy front loaded and there would definitely be interest after this bonus is paid on July 1st. Patrick Marleau – $6.25 million through 2020 – His cap hit next will cost a younger winger his job with the Leafs next season. Buyout proof and has a $3 million signing bonus on July 1st. Some think he could head back to San Jose. Has a no-movement clause. Kasperi Kapanen – pending RFA – Teams would be interested and he or Andreas Johnsson could get an offer sheet. GM Kyle Dubas on Kapanen and Johnsson. Andreas Johnson – pending RFA – see Kapanen above. Connor Brown – $2.1 million through 2020 – bottom-six player that has seen his goal total decrease. Defensively responsible, does the dirty work, and kills penalties. Would Connor McDavid welcome his former Erie (OHL) teammate? Nikita Zaitsev – $4.5 million through 2024 – the 27-year hasn’t lived up to the contract and struggles in his own end. Would the Maple Leafs retain salary to move him?